Be joyful and eat for an abundant life!! Green beans, also known as french beans or snap beans, are tender, elongated, firm yet flexible edible pods of a bean plant. There are over 130 varieties of green beans. The pods color can be green, purple, red or streaked. They are in season from summer through early fall. 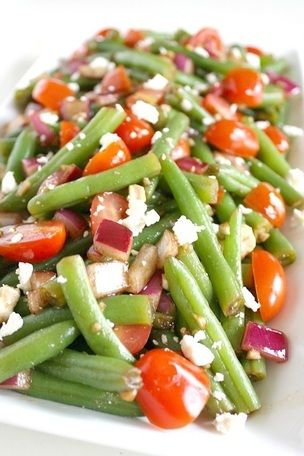 Green beans belong to the same family as shell beans, such as pinto beans, black beans and kidney beans. Green beans are an excellent source of vitamin K and a very good source of copper, vitamin B1, vitamin B2, manganese, vitamin C, folate and fiber. When purchased fresh, they should have a smooth feel and a vibrant green color. They should be free from brown spots or bruises. They should have a firm texture and “snap” when broken. Unwashed fresh beans should be stored in a plastic bag kept in the refrigerator crisper. They should keep for about seven days. Whisk ¼ cup water, soy sauce, tomato paste, vinegar, crushed red pepper to taste and 1 tsp cornstarch in a small bowl. Set aside. Cut tofu into ½-¾ inch cubes and pat dry. Toss the tofu in a bowl with the remaining 2 Tbsp cornstarch to coat. Heat 1 Tbsp oil in a wok or large skillet over medium high heat. Add the tofu and spread out across the surface of the pan. Let cook undisturbed for 2 minutes. Gently turn and stir. Continue cooking, stirring occasionally, until lightly browned and crispy. Transfer to t plate. Reduce heat to medium. Add the remaining 1 Tbsp oil to the pan. 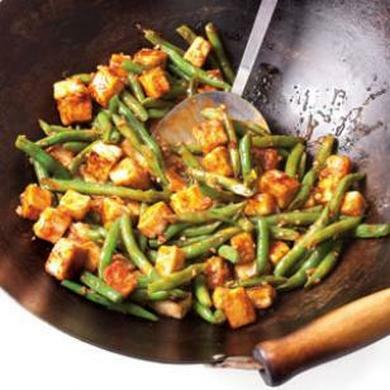 Add green beans, garlic and ginger; cook, stirring constantly, for 1 minute. Add the remaining ¼ cup water, cover and cook until the beans are crisp-tender, 2 to 4 minutes. Stir the reserved soy sauce mixture and pour it over the green beans. Cook, stirring, until thickened, about 1 minute. Add the tofu and cook, stirring until heated through, about 1 minute more. Place beans in a 6 qt pot; add water, bring to a boil. Cook covered 8-10 minutes or until crisp=-tender. Drain and immediately place into ice water. Drain and pat dry. In a small bowl, whisk oil, lemon juice, vinegar, salt, garlic powder, mustard and pepper. Drizzle over beans. Add onion; toss to coat. Refrigerate, covered at least 1 hour. Just before serving, stir in tomatoes and cheese. Place cashews in a bowl and cover with water. Soak for at least four hours or overnight. Blend soaked cashews with almond milk in a blender or food processor until completely smooth and creamy. Set aside. Place onions, bread crumbs, flour and 1 tsp salt in a large bowl, tossing to combine. Be sure to separate each individual onion piece. Spread onions in an even layer on a baking sheet sprayed with a cooking spray. Spray onions once again with cooking spray. Bake for 25 minutes, tossing halfway through. Once onions are done cooking, remove from oven and lover oven heat to 350F for casserole. Bring a large pot with two inches of water to boil. Once boiling add green beans. Bring back to a boil and cook over medium heat for about 5 minutes, or until crisp-tender. Drain and run cold water over green beans to stop cooking. Set asked. In a large skillet, heat olive oil over medium heat. Once hot, add onion. Cook for five minutes and then add garlic and mushrooms. Cook for another ten minutes, stirring often. Add nutmeg, soy sauce, white wine, 1 ½ tsp salt, pepper. Simmer for about five minutes. Stir in cashew cream and ¼ of the baked onions. 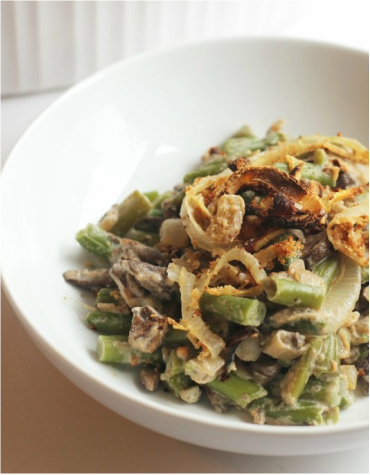 Stir in cooked green beans. Spread mixture into a large casserole dish. Top with remaining baked onions. Bake at 350F for 20 minutes. Place sliced onions and lemon juice in a small zip lock bag and seal out air. Let sit at room temperature while you prepare the rest of the recipe. In a small bowl, drain off liquid from onions and add the Dijon whisking to combine. While whisking add remaining tablespoon of oil to make vinaigrette. 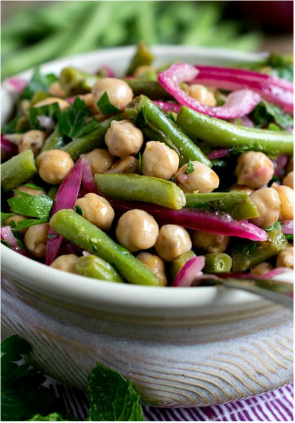 In a large bowl combine cooled chick pea and bean mixture, marinated onions, chopped parsley, chopped mint and dressing. Stir to combine and cool to room temperature before serving.